Bacteria talk with each other using a chemical 'language'. Using quorum sensing, they can even coordinate their defenses and mount attacks. This amazing talk by researcher Bonnie Bassler, who teaches molecular biology at Princeton, goes through some of the discoveries made by her lab group. It's about eighteen minutes long, but it's a fabulous presentation. 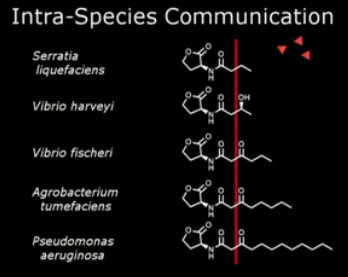 Just one of the many topics covered is the subject of intra-species communication by bacteria. It turns out that all bacterial "languages" all share the same root "words". Regular technovelgy readers already know about some of these developments; I wrote about Bassler's work on quorum sensing four years ago. Five years ago, I even compared the universal language of bacteria to Esperanto, just like Dr. Bassler did in this 2009 video. The bacteria-driven motor consists of a square central basin into which the M. mobile are deposited. New Bacteria Eats Plastic; What Could Go Wrong? Daniel Burd may have figured out a way for humanity to take care of the five hundred million plastic bags tossed into landfills and the ocean every year. An artificial cell-to-cell communication network teaches bacteria to communicate with each other. "We were surprised to find these bacteria because asphalt is an extreme and hostile environment for life to survive," said Jong-Shik Kim. According to researchers, up to 100 bits of data can be attached to each organism. I almost forgot to mention my own introduction to the idea that bacteria might 'talk' to each other and even communicate with the host - namely, the intelligent cells from the marvelous 1984 novel Blood Music, by Greg Bear. This video comes from the TED conference - see Bonnie Bassler: Discovering bacteria's amazing communication system.